About "Inuvialuit Pitqusiit Inuuniarutait: Inuvialuit Living History"
This project is focused on a little-known collection of objects housed at the Smithsonian Institution in Washington, DC. 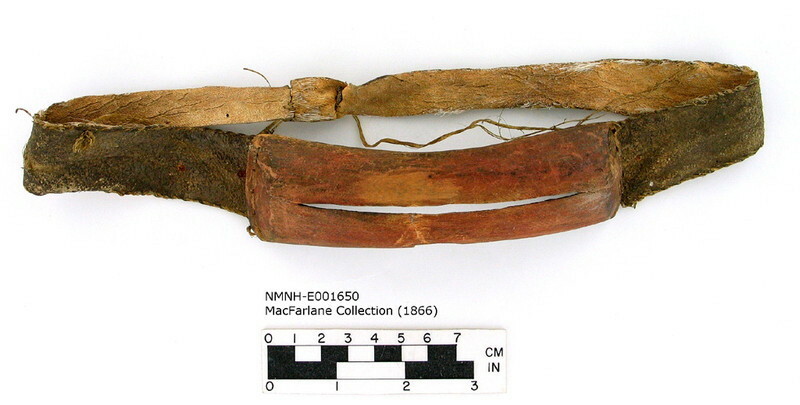 Called the MacFarlane Collection after the Hudson’s Bay trader who assembled the objects, the collection includes nearly 5000 natural history specimens, such as birds’ eggs and animal skeletons, and an additional 300 cultural objects collected from Anderson River Inuvialuit in the 1860s. Few people have ever seen the collection in its entirety, as it has been in the Smithsonian’s care for nearly 150 years. In 2009, our project team sought to change this situation by raising funds to take a small group of Inuvialuit Elders, traditional experts, and educators to Washington for a week-long workshop with the collection. This modest start brought much interest from the Inuvialuit and museum communities, and from the local and national media. The trip launched a much broader program of outreach with Inuvialuit youth, Elders, and community members, and the generation of new knowledge about the MacFarlane collection and its ongoing life in Inuvialuit communities, which we describe in this website. During our visit at the National Museum of Natural History in 2009, elder Albert Elias described the MacFarlane Collection as a “living collection”. As curator Stephen Loring pulled intricate items of clothing, tools, hunting, and artwork from storage, members of the project team recalled how many of these objects had once been used in practice. They also discussed how new access to artifacts in the collection will inspire the re-creation of cultural objects and other cultural activities and education programs. For our project team, the MacFarlane Collection represents “Inuvialuit Pitqusiit Inuuniarutait: Inuvialuit Living History”. Inuvialuit Pitqusiit Inuuniarutait (Inuvialuit Living History) is a work in progress. It has been designed to create access for Inuvialuit people and interested public wherever they live to the Smithsonian’s MacFarlane Collection. We have designed the website to provide a view into the emerging and dynamic relationship between Inuvialuit peoples and the MacFarlane Collection, and to promote the collection as a place for learning and teaching. The website features teachers’ resources and interactive lesson plans tailored to meet the requirements for the Northwest Territories curriculum, so that Inuvialuit youth can reference their own culture and history online. We use artifact descriptions from the Smithsonian, and those that were developed in the course of this project, as well as video and photographs of our workshop with Inuvialuit elders, youth, cultural workers at the Smithsonian, and our team’s consultations in the Inuvialuit Settlement Region, to show how the MacFarlane collection is becoming a “living collection” once again through its reconnection to Inuvialuit people. We use interactive maps to connect the artifact records and related community media to places in the Anderson River area, and show how knowledge of the collection is being applied in every day life. The website provides information about the history of the collection, including the biography of Roderick MacFarlane and the short life of Fort Anderson; about the Smithsonian Institution, and how it came to be in possession of these invaluable artifacts; and about repatriation, ownership, and intellectual property rights to the collection. We also want the website to reflect the collaborative spirit in which the website is being built, by including video and photographs of our production process. In addition to teaching about the collection and this project, it is our goal to create a website that can become an archive of documentation of community activities and other resources related to ongoing educational and cultural programs related to the MacFarlane Collection.